Which, by the way, confession time. I actually did NOT like to wear sunscreen for the longest time and there’s a reason why. When I was in high school, I played a lot of tennis. I spent a lot of afternoons under the hot Southern California sun, practicing, hitting balls, basically having a great time. I loved it! I remember my mom would nag and nag about wearing sunscreen (being the good Asian mother she is) and I would ignore her, because I didn’t think I needed it! I was only in high school – what did I care if I got a tan? Big deal. Eventually her nagging wore me down and I gave in – I wore sunscreen. Then, I remember getting our team photos for the yearbook back and being completely mortified – I had a horrible white cast on my face!! In contrast with my teammates, I looked so awful and it was so embarrassing. That was the last time I ever wear sunscreen! – I vowed to myself. Well, fast forward to college, when I started noticing dark spots on my face. I was barely 20! I didn’t understand that sun damage can cause premature signs of aging such as sun spots, wrinkles, and fine lines. Once you get these, it’s very difficult to reverse, so prevention is definitely key. This is why I cringe SO HARD when I see people tanning without sunscreen, or even worse, going to tanning bed salons! From that point on, I have tried many different sunscreens and am glad to report that they have come a long way since my high school days. There are many kinds of sunscreen now that will provide the protection without the awkward white cast. But I get it – not everyone wants to spend hours and hours researching sunscreens and they’re so complicated! SPF, UVA, UVB, Broad Spectrum, PA+++, ingredients, brands – how do I pick the best one for me?! Consider this your complete guide to sunscreens. We’ll break down the difference, and help choose the right sunscreen for your skin type and concern. If you don’t want to read, then just watch the video below. If you want an infographic to tie it all together, I’ve got you covered there as well. Just scroll down! First, to understand why not wearing sunscreen can lead to fine lines and sun spots, we have to understand that the sun emits two types of rays, both of which are harmful for your skin, but in different ways. It’s important to note that just like zombie apocalypses, when it comes to harmful rays, you are not safe indoors or on cloudy days. Which is why you gotta wear sunscreen daily. What does this mean? When looking at sunscreen labels, look for the words “Broad Spectrum” – this means it protects against both UVA and UVB rays. Here’s something you might be more familiar with: SPF. SPF stands for Sun Protection Factor, and it’s a unit of measurement used to indicate how effectively it protects against UVB rays, which causes sunburns. But, did you know that while SPF can tell you how it protects against sunburns, it does not indicate how it protects against wrinkles? In order to see how effectively a sunscreen protects against UVA rays, which remember, causes aging, you have to look at the PA rating, which is not show on sunscreens sold here in the U.S. but is common and prevalent on Asian sunscreens. If you shop for Asian sunscreens, you will notice that almost all of them will indicate the PA rating, which is measured in the form of plus signs. The more plus signs the sunscreen has, the higher the protection against UVA rays. Tip: Just because a sunscreen doesn’t indicate the PA rating, doesn’t mean it doesn’t protect against UVA rays, it just isn’t a popular rating that US consumers are familiar with or look for, which is why brands don’t include it in the labels. So, how to choose the right SPF and PA rating? A good rule of thumb when looking for SPF is based on how much exposure you will have to the sun and the risk you’re in for getting sunburned. If you work mostly indoors and are looking for an everyday sunscreen, SPF 30 is sufficient. If you spend a lot of time outdoors for work, or you’re spending a day hiking, at the pool or at the beach, then I recommend an SPF of at least 50, with frequent reapplication – at least once every 2-3 hours. If you are shopping for Asian sunscreens and want to know what PA rating to choose, I always go for the maximum protection, which is PA+++, to not take any chances with wrinkles, spots, or other early signs of aging. Physical sunscreens contain zinc oxide and titanium dioxide and are sometimes referred to as mineral sunscreens or sunblock. These sunscreens work like a mirror to deflect the sun’s rays. Cons: Because the minerals naturally occur as a white powder, these sunscreens are generally associated with the white cast that most people associate with sunscreens. Chemical sunscreens work by absorbing the sun’s rays and transforming them into heat, which is then released from your skin. It’s not necessarily bad, but for people who don’t like the idea of chemicals in skincare might prefer to use physical sunscreens instead. Higher chance to cause allergic reactions or irritate skin, since multiple ingredients have to be combined together to provide the broad spectrum protection we talked about earlier. Whereas physical sunscreens start to work the second you apply them, chemical sunscreens take time to activate after application. So another way to differentiate between physical and chemical sunscreens aside from reading the ingredients is to look at usage directions. If it says apply 20-30 minutes before sun exposure, it’s likely to be a chemical sunscreen. Deciding between physical and chemical sunscreens really comes down to personal preference. At the end of the day, I recommend choosing a formula that you will actually want to wear, because if you don’t like the formula, the chances of you using it will be slim. So choose a formula you like, and stick with it! To help you remember the important points of choosing a sunscreen, here is a handy-dandy infographic for your pinning pleasure! 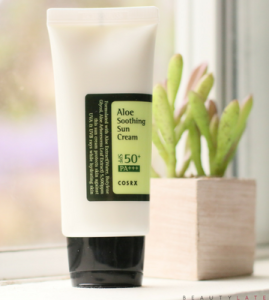 Here are some of my picks for everyday sunscreens that work well! 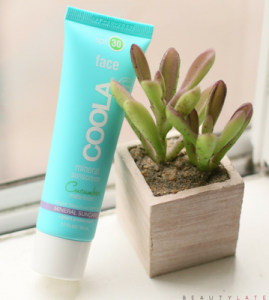 For oily/combination skin, COOLA Broad Spectrum Mineral Sunscreen with SPF 30 is a good choice and has a matte finish. It does contain silicones to give it that smooth, powdery finish, so I wanted to bring that up. 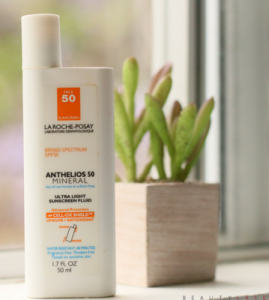 It’s also infused with Cucumber Extracts and natural rose hip oil that is rich in free radical fighting Vitamin C.
For sensitive skin, I would recommend La Roche Posay’s Anthelios Mineral Ultra Light Sunscreen SPF 50. La Roche Posay is a French sunscreen brand owned by L’Oreal and is quite famous in Europe. They have been focusing a lot on gaining a bigger share of the suncare market here in the US. Their patented technology, Cell-Ox Shield, protects against UVA and UVB rays as well provides a powerful antioxidant to fight free radicals – bonus protection! La Roche Posay products are also infused with mineral rich thermal water that makes it a great choice for people with sensitive skin. It’s a super light fluid and provides an excellent base for makeup application and is also water resistant, fragrance free, and paraben free. For oily/combination skin, this one is a great choice made by the Korean brand CosRX. It’s their Aloe Soothing Sun Cream SPF 50 PA+++. It’s a super light sunscreen that blends in amazingly into the skin with no greasy after feel. It’s also a great choice for people who have acne prone skin. 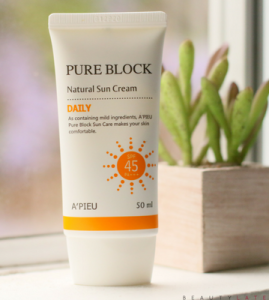 For dry/dehydrated skin, this sunscreen is made by another Korean skincare brand A’Pieu and it’s their Pure Block Natural Sun cream with SPF 45 PA+++. Now, the name of this sunscreen is misleading, because it’s neither a sun block nor natural. It is, however, a great sunscreen and goes on light, is non-greasy, and it’s hydrating formula is great for people who have dry skin and needs a little boost of hydration. In certain parts of the world, summer can be hot and humid, and the last thing you want to do is put on a sunscreen lotion or cream. In these instances, I recommend my personal favorite that I reach for the most often. The downside is that it’s made by the Taiwanese brand White Formula and not readily available here in the U.S. It’s their UV Protective Gel with Hyaluronic Acid SPF 50 and PA+++. It’s a supremely hydrating formula thanks to containing three types of hyaluronic acid which is a key ingredient in hydrating the skin. It’s a great choice for people who prefer gel-formulas to lotion or cream formulas and goes on almost sheer and blends straight into the skin. It’s an excellent base for makeup application thanks to its great moisturization but is not greasy or heavy at all.